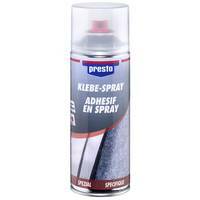 Presto Adhesive Spray is a multi-purpose contact adhesive for long-lasting or temporary adhesion. Presto Adhesive Spray is a multi-purpose contact adhesive for long-lasting or temporary adhesion. The spray rate can be controlled due to an adjustable valve. Problem-free, easy application.